What's a cup of coffee without a cake to go with it? 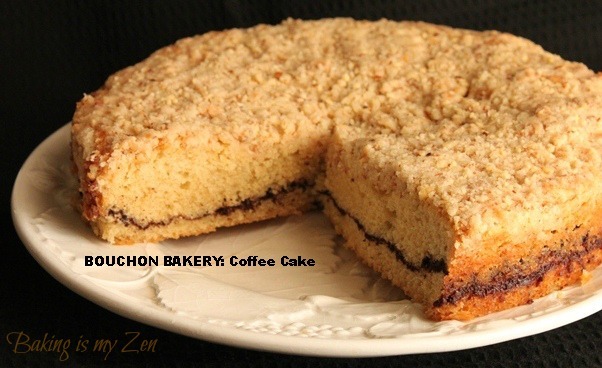 We made Bouchon Bakery's coffee cake this week and aside from some overfilling issues, the recipe is simple to execute. The crisp streusel topping has a nice crackly appearance on top and the dusting of powdered sugar, cinnamon and cocoa is a must. You'll want to make this to go with your morning Starbucks from now on. I did have overflow problems with the two individual cakes but the little crispy bits that clung to the sides of the papers tasted delicious. When I get coffee cake usually it is moist and dense. This recipe yields a cake that is more fluffy like pound cake. In talking with baker, Tania she said hers was more dense so it could be that I whisked the eggs a little bit more. I really like the cocoa swirl in the middle and the almond streusel top. I would add more of both though making a larger cake like I did, so that the flavors distribute. This is a versatile recipe and you could add other things inside like nuts, chocolate chips or blueberries. The batter was fairly easy to make, with only a short chilling time. I had all the ingredients on hand, and only had to buy the paper baking molds. The instructions say to pipe a swirl around the bottom of the mold, coming up only 1/4 inch, then sprinkle on the topping, then add another layer of batter, leaving 1/4 inch of room at the top. I only had enough batter to fully fill 2 molds and halfway fill 1 more. I was surprised because the recipe indicates that it makes 6. After baking for the recommended time, the full molds exploded! They were obviously overfilled, and the batter rose too high and then fell over the sides. But the one that I only halfway filled came out perfectly! So the next day I made it again, re-reading the instructions carefully. There is no way to pipe a swirl that covers the bottom of the mold and have enough batter for all 6. Again, I made only 3 cakes, but was more careful and they only overflowed a little bit. I'm not sure if the instructions aren't clear or if I simply don't understand them. I made this recipe twice. The first time I discovered that the paper molds I had were 4 3/4" and the recipe is designed for 4 1/4" molds. The batter was easy to make and after chilling was quite easy to pipe. The first time however, I piped probably a bit heavy and exceeded the "1/4" thick spiral; I was only able to make three coffee caked with the amount of batter in the recipe. Probably a combination of excess piping and larger paper molds. The second time I doubled the batter and was able to perfectly fill 6 molds. Two of them still overflowed ever so slightly. Over all this is an extraordinary coffee cake. 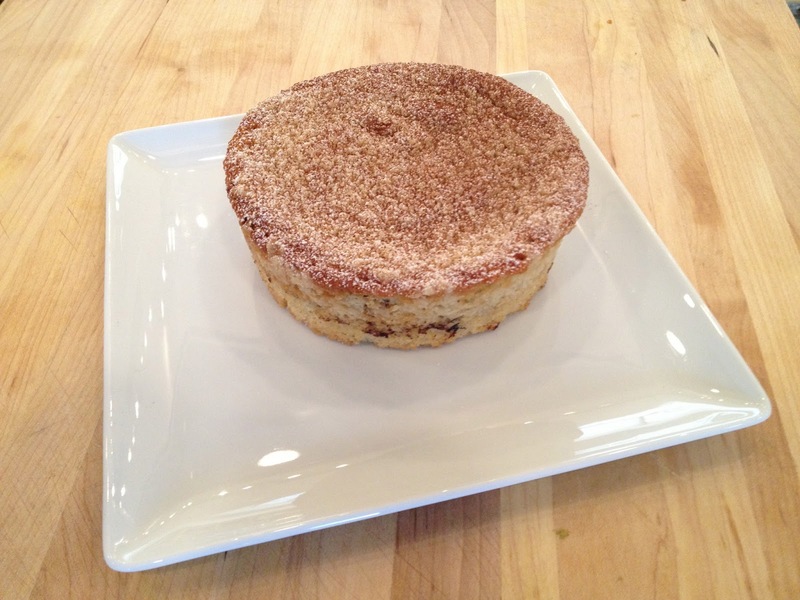 The almond streusel creates an excellent crisp contrast to the rich moist interior. This Coffee Cake recipe is one that will make its presence in my kitchen many times over. Amazing little cakes! 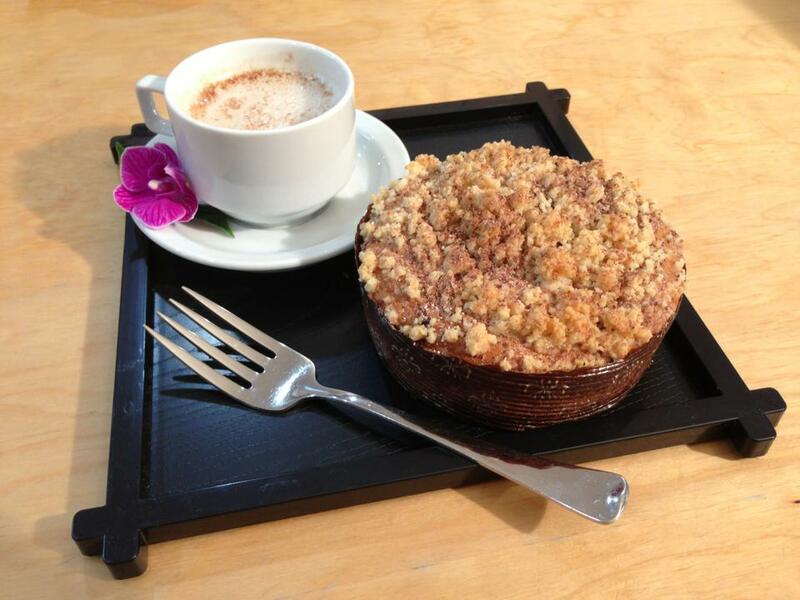 The little coffee cake has a very light, with a melt in your mouth texture and a crunchy flavorful topping. I easily devoured one with my cup of chai tea for breakfast. An excellent idea for a one person serving. The recipe and directions were easy to follow. I refrigerated the batter overnight, piped the batter into the paper molds and baked them up for breakfast. I did have to bake them an extra 10 minutes because the batter was cold. And do bake them at the recommend low temperature of 325F. I made the following modifications to the recipe, I reduced the granulated sugar to 155g and substituted Greek yogurt in place of Crème fraîche. Definitely another great recipe to make and serve with tea and coffee. Made these 2 weeks ago. Again a x6 batch (I bring goodies to a meeting every Friday night) With making 36 the cakes varied in baking results - have not deciphered why but I am thinking there may have been something to do with a 'rest' between the first and 4th 5th 6th batches. The batter did rest in the fridge overnight as directed. As I baked the last 3 batches of 6 each - they were perfect - no overflowing. My first three batches overflowed / deformed (but extremely edible!) they just didn't look as good as the latter 3 batches. Followed directions to a T (I follow all the recipes in this particular book to the letter), exact times, ingredients and bake ware. When multiplied by 6 I got exactly 36 cakes. Using the pipe to fill was very helpful. I also sprayed my 4" paper cups to help with removal - it helped but not 100%. Would love to try these with blueberries or apples from my garden later this summer - yum! That is a really interesting observation. Both Jenn and I had the same problem with overflow, so maybe chilling the batter more would prevent that. Good insight! I'm a good cook and I have planned to through a small party for my friends at my residence. This article gave me an idea. I could make coffee cakes as a snack for all. Clever idea isn't it? Thank you for writing this blog post about coffee cakes. Great job, bakers! This is definitely going on my to do list! Thanks Genia! Please do send that to us when we get to the tarts and we hope you continue to bake with us.